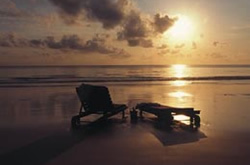 Bluebay Beach Resort is situated on the finest wide, white, sandy beach on the island of Zanzibar. 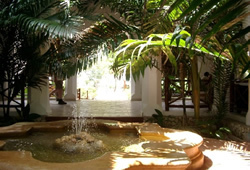 Located on the East Coast in an area known as Kiwengwa, the hotel is only 35 minutes drive from the town and the airport on a recently built tarmac road. Bluebay Beach Resort is situated on the most magnificent 25 acre site with its bedroom cottages located on rising ground overlooking verdant gardens, the public areas, the pool, the more than 1,000 beautiful palm trees, the sparkling white beach and the azure sea with its coral reef offering particularly warm and safe swimming. All rooms are tastefully decorated using traditional Zanzibari furniture to include large four poster beds with mosquito nets, a writing bureau, coffee table and easy chairs. Split level air conditioners, ceiling fans, satellite TV's, mini-bars, hair dryers and telephones add a touch of luxury to each room. ideal place for guests to sip cold drinks or to enjoy a feast of seafood specialties or pizzas prepared in our authentic wood fired oven, all served in an informal setting with toes in the sand and a magnificent thatched roof to shade you from the hot tropical sun. During these days of leisure, stimulate your taste buds as well, try out the health food options created by our connoisseur chefs using ingredients grown in our own gardens. 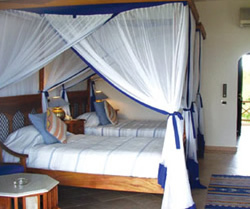 Facilities include an open air discotheque, a wide screen TV viewing facility, guest safes, a large fresh water swimming pool with adjoining open-air Jacuzzi and children's paddling pool, a children's club ( on demand ), a well equipped Dispensary with Doctor on call and the most fantastic spa in East Africa. As with everything at the Spa, the skin care products have been selected for their pure and natural ingredients. For a really memorable experience ask your therapists to blend and mix the local spices and fruits right in front of you. All these natural freshly prepared treatments are famous for their virtues for the body and aromas to relax the mind. The hotel provides a Fitness Centre a flood lit tennis court, 5-star PADI Scuba Diving Centre and a Water Sports Centre with windsurfers, canoes and sailing boats. Table tennis as well as snooker and billiards tables are also available.